Heading to Nashville? 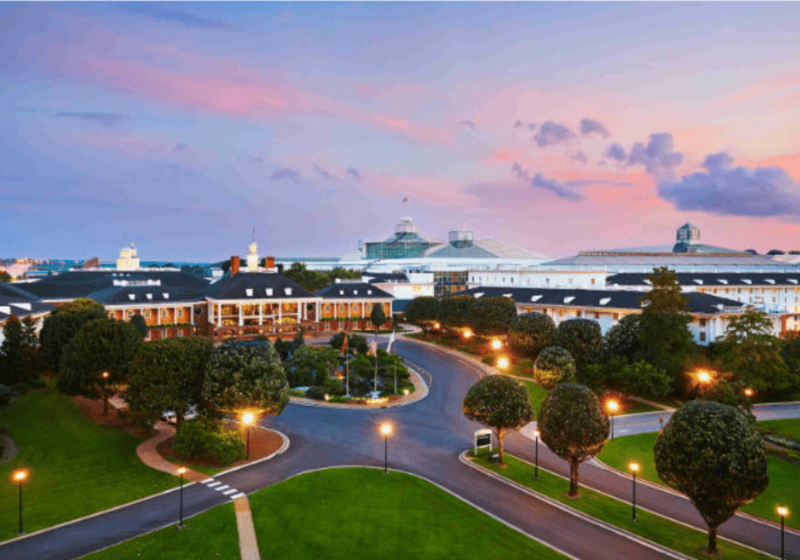 If you're looking for a resort with a wow factor, Gaylord Opryland Resort is just the ticket. By far the largest hotel in Nashville, this sprawling 2,800-room resort is a destination in itself. It can feel like a giant terrarium, housing three lushly landscaped garden atriums complete with waterfalls, fountain shows, and winding paths that travel alongside koi ponds and tropical plants, all weatherproofed under nine acres of glass roofs. One of the atriums even features an indoor river where guests can take flatboat cruises. Country music fans will love that the resort has a stellar location right next to the next to the Grand Ole Opry and just a few minutes to downtown Nashville. The resort also features multiple venues where you can hear live Nashville music, or you can book a dinner cruise on Nashville’s Cumberland River on the General Jackson paddlewheeler showboat with its four decks and a beautiful two-story Victorian Theater, where live shows are performed. The resort is almost a city within a city, with 17 restaurants ranging from casual to fine dining (including pizza, burgers, Tex-Mex, and gelato) and numerous shops. The resort offers three outdoor pools and one indoor pool, plus an arcade and children's activities. Parents can hit the fitness center, book treatments in the resort's spa, while golfers can reserve a tee time at the 18-hole Gaylord Springs Golf Links, designed by former U.S. Open and PGA champion Larry Nelson. One downside to this resort is that it can feel too large and impersonal, and you can find yourself doing a lot of walking to get from A to B. Families can also feel nickel and dimed here, due to the resort fee (which covers wi-fi), pricey parking fees, and the lack of a complimentary breakfast. With eight room and suite categories, there are options at various price points. Some of the guestrooms have private balconies overlooking the spectacular atrium. The highlight of the year is the resort's six-week Country Christmas celebration, which features more than two million lights and dozens of extravagantly decorated Christmas trees. From mid November through New Year's Day, families visiting the Gaylord Opryland Resort can experience ICE!, a themed extravaganza carved from more than two million pounds of colorful ice and kept at a crisp nine degrees. The attraction features a signature two-story ice slide room and an interactive The Frostbite Factory experience where visitors can see first-hand how master ice-carving Chinese artisans create ICE!